Paramount Pictures has denied it is set to follow in Warner Brothers’ footsteps by dropping its support of the Microsoft backed HD-DVD format in favor of Sony’s Blu-ray technology. “Paramount's current plan is to continue to support the HD-DVD format,'' Brenda Ciccone, a spokeswoman for Paramount told Bloomberg Tuesday. The Financial Times had earlier reported that Paramount, which is set to release a number of likely blockbuster movies during 2008 including the latest Indiana Jones film, is poised to defect to the Blu-ray camp in a move that ‘will sound the death knell of HD-DVD and bring the home entertainment format war to a definitive end'. 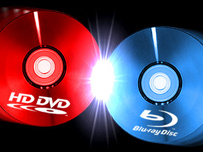 According to the FT, Paramount, which came out in support of HD-DVD last summer, joining Universal as the main backer of the format, is thought to have a clause in its contract with the HD-DVD camp allowing it to switch to Blu-ray if Warner Bros changed allegiances. Warner defected to Blu-ray last week, joining Walt Disney, 20th Century Fox and Metro-Goldwyn-Mayer as backers of the Sony format, increasing the possibility that Blu-ray will prosper over HD-DVD in the same way VHS was victorious over rival video technology Betamax during the format war in the 1980s.